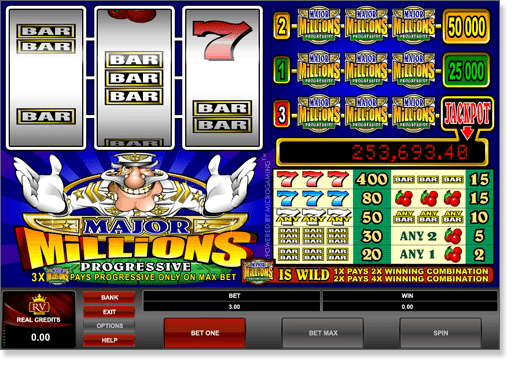 Major Millions is part of Microgaming’s progressive jackpot network of online slots, and features two game formats: a classic 3-reel and a modern 5-reel design. Wild symbol: The Major Millions logo – this fills in the blank for any symbol (except the scatter) for any possible winning combination. It also triples the value of the winning payout when used as a wild symbol. Scatter symbol: An explosion of coins and diamonds – when three of more scatter symbols show up anywhere on the five reels, this triggers a winning payout. Scatter wins are multiplied by the total number of credits staked. Other symbols: The major, the major’s hat, a tank, an aeroplane, a ship, three medals, a chest of ammunition, a top-secret envelope and binoculars. The progressive jackpot is won by matching five wild symbols on the 15th pay-line. You are required to bet the maximum (15 coins across all 15 pay-lines = one coin per line = $3) in order to have a chance of winning the jackpot. Below are two screenshots of the five-reel game (L) and the three-reel game (R). Both always maintain the same jackpot. Wild symbol: The Major Millions logo – This symbol substitutes for any other symbol in order to complete a winning combination. One Major Millions logo multiplies the payout of any completed combo by two, two symbols multiply the payout by four. 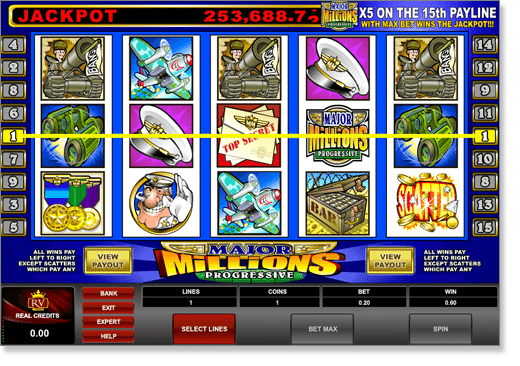 If three Major Millions symbols appear on the middle pay-line, the player is paid out 25,000 credits. If three Major Millions symbols appear on the upper pay-lines, the player is paid out 50,000 credits. The number of coins wagered determines how many pay-lines have been activated: one coin bet ($1) activates the middle line, two coins ($2) bets activates the upper and middle lines, and three coins staked ($3) activates the lower, upper and middle lines. Three Major Millions symbols on the third pay-line wins you the progressive jackpot. You must wager the maximum bet in order to qualify for the progressive jackpot. Across both games: if there is more than one winning combination on any pay-line, the player is paid out the value of the highest winning combination. Major Millions is only available for real money players (RMPs) and can’t be played in practice mode. Sign up for an account at Royal Vegas Casino to claim your $1200 welcome bonus and see if you can win big with Major Millions.